As I mentioned earlier this week, I thought it would be fun to devote Fridays in February to one of the most prolific and popular leading men of the 1930s and 1940s – Fred MacMurray. His fame perhaps hasn’t lasted through the ensuing decades the way it has for some of his contemporaries, like Jimmy Stewart or Henry Fonda, which is a shame. He was very talented, not to mention easy on the eyes in his younger days! Like a lot of people my age, for years my only knowledge of Fred MacMurray came from reruns of My Three Sons and from the Disney movies he made in the 1960s, like The Absent-Minded Professor and Son of Flubber. Only in the past few years have I begun to realize what an interesting career he had before that, acting in a variety of movies with some of the greatest leading ladies of the Golden Age, among them frequent co-stars Barbara Stanwyck, Carole Lombard and Claudette Colbert. When I saw Remember the Night for the first time, I was floored. Who was this handsome, romantic, funny guy? Who knew that wise, pipe-smoking father Steve Douglas used to be like that? He was pretty dreamy! It seems MacMurray’s popularity is on the rise however, at least among devoted classic movie fans. Quite a few of his films have been released on DVD recently and I see his name popping up frequently on other blogs. I’m glad about that, because his work deserves the attention. I, for one, am enjoying getting to know his movies, from the charming, witty roles in his early romantic comedies to the edgier parts he played in later movies like Double Indemnity and The Apartment. 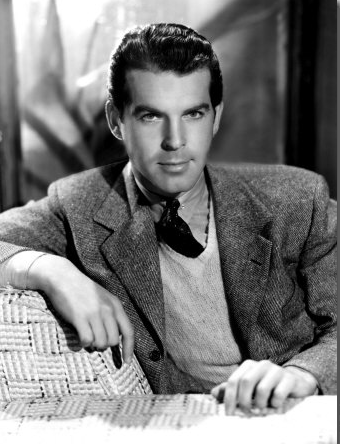 To learn more about Fred MacMurray, I recommend checking out this great 2008 interview with his biographer, Charles Tranberg, on TCM’s Movie Morlocks blog. Not only was MacMurray a multi-faceted talent, he was also one of the genuinely nice, decent men in Hollywood. Maybe that’s one reason his fame hasn’t lasted. Stars with more scandalous, dramatic personal lives tend to be more memorable, sad to say! 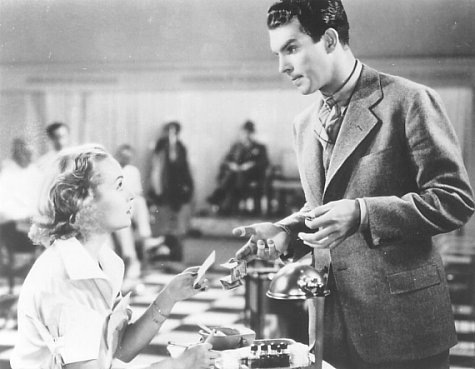 On with the first of our Fred MacMurray Friday movies, the thoroughly delightful 1935 romantic comedy Hands Across the Table, co-starring Carole Lombard and Ralph Bellamy, directed by Mitchell Leisen. 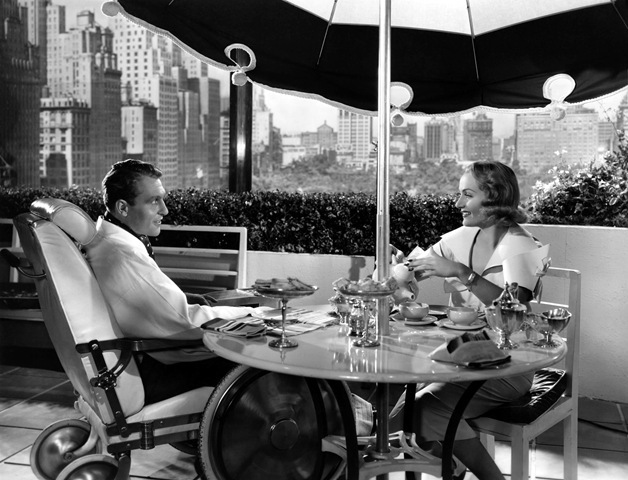 Carole Lombard plays Regi Allen, a hotel manicurist who is determined to marry a rich man. She grew up seeing what poverty did to her parents’ marriage, and she refuses to live the same kind of life. One day she is called upon to manicure a wealthy hotel resident, Allen Macklyn, played by Ralph Bellamy. Allen used to be an aviator, but a plane crash left him paralyzed and bitter. Regi charms him, however, and soon he’s calling her for manicures whether he needs them or not, just to have her company. They become good friends and Allen falls in love with Regi, though he hides that from her. Instead he listens to her talk about her romantic prospects in the role of best friend and confidant. When Regi meets Theodore “Ted” Drew (Fred MacMurray), the son of a well-known family, she’s sure he’s the rich husband she’s been looking for. After a hilarious episode in which she nervously gives him the worst, most painful manicure of all time, they go out together and have a fine time. Later that evening, drunk, Ted admits that his family lost all their money in the 1929 crash and that he’s engaged to a wealthy girl. Like Regi, his priority is to marry money, so they’re obviously not right for each other. Regi is disappointed and upset, but she allows the drunken Ted to crash on her couch that night. When he misses his boat to Bermuda the next morning (his future father-in-law paid for the ticket and he can’t afford to buy a new one for himself), he sticks around. Over the days they spend living together, Regi and Ted get into crazy situations and have a good time. They get to know and care about each other, and of course they fall in love. But it’s not all zany comedy. There are some truly romantic moments as well, particularly on the last night Ted and Regi spend together before he is set to leave and get married. Those scenes have a lovely, quiet intimacy, as they try to convince themselves that their being in love with each other doesn’t matter, and that marrying for money is what they both really want to do. There’s also some heartbreak involved when Regi’s friend, Allen, wants to propose to her. Before he can give her the ring, he realizes she only sees him as a friend and is crazy about Ted. He gives up with good grace, but it’s still a little sad to see. If there’s one thing I’d change about the movie, it’d be making Allen more of a real corner in the triangle, instead of just the nice guy Regi doesn’t think of at all romantically. It would’ve been refreshing to see that a disabled person was a genuine rival for Regi’s affections. 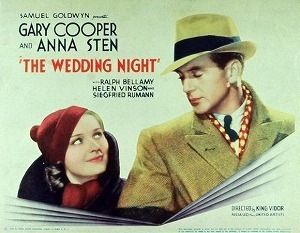 Ralph Bellamy is very appealing and loveable in his role. I think this is the first movie I’ve seen in which I actually liked the Bellamy “other man” and almost wished the heroine would marry him instead! 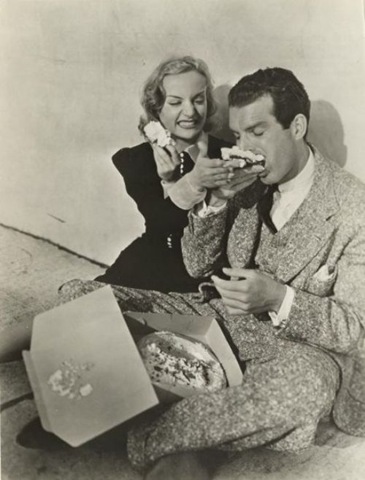 Carole Lombard was adorable! The more I read about her the more it seems she was one of the loveliest, smartest, most hilarious and endearing actresses of the era. She was just terrific, and she shines in this movie. Hands Across the Table is a great blending of the silly and the heartfelt, the sweet and the cynical. I loved it. The film is available in Carole Lombard: The Glamour Collection and airs on TCM sometimes, too. 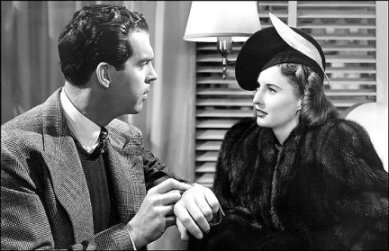 It’s a real treat of a movie and a nice example of Fred MacMurray’s early romantic comedies.